When I'm not in my favorite feminine frocks I usually slip into something classic: a striped shirt (my new favorite is from StyleMint), tailored trench coat, chic blazer, etc. Recently, someone said I dressed "classic with a twist" and I thought that was fun. I guess I do find myself adding a bit of quirk to my otherwise simple style. There is so much good going on here that I can't decide what I like best...the necklace, stripes or leopard loafers. LOVE! Oh yes! Perfect description. You are so lovely! love the leopard shoes, of course! This is such a perfect, simple outfit. You look relaxed, but oh-so-chic. Especially love the RM bag and your leopard-print loafers! I have the same tee but in red striped so Parisian chic and fun! Super cute combination! Love the necklace! Loving this take on the new classics. Amazing! love the blue stripes with the necklace Taylor! very cute! Love this simplicity of this look. It's right up my alley with the stripes and leopard print! Love to your loafers :) and your necklace is very fab too! love how you accessorized the outfit! very nice. LOVE!!!! Those leopard flats are amazing! Oooo I love this look! love the stripes with the leopard... great mix! I love this look - you always look wonderful though. The stripes, shimmer and leopard are a sweet match. you look lovely! I like your necklaces!!!! Classic stripe is always a good backup plan. I also like your leopard shoes. i love taking a break from my formal business wear with some denim and a comfortable tee; beautiful look, especially the accessories! you can never go wrong with a striped shirt! Gorgeous look! I love it all. Must get my hands on that bag and loafers! i love this cozy and classic look! Love this! That necklace makes me weak at the knees! It's amazing how you glammed up the simple casual look, layering those necklaces was a great idea! Love this casual look but I just saw you in the pink dress a few posts ago... AMAZING!!!! You look itty bitty! Sometimes it's the "simple" looks that really work. You look amazing. Stripes + leopards. You sure got the 'classic' part right! Stripes and leopard...unlikely pairing but you made it work. Cute outfit and I like the fit of the jeans. What a simple yet stylish outfit! Love your animal print flats and love, love, love your pink lipstick!! You look ADORABLE, Taylor! I love your necklace. Love the nautical mixed with leopard! Perfect! I love this look! The leopard loafers are the perfect addition to a classic striped tee & jeans look! Love it!! 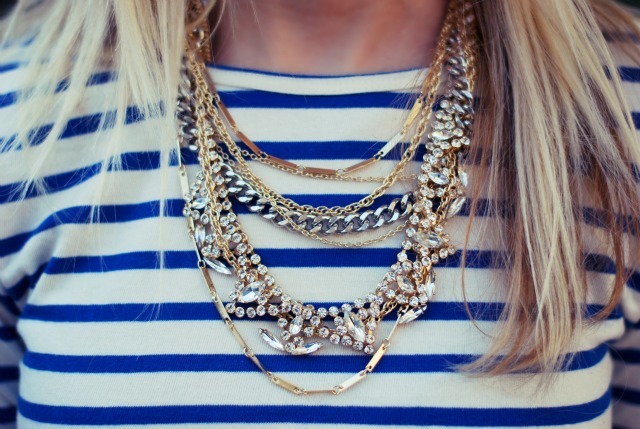 Your layers of necklaces look amazing with the casual striped shirt. Great look today! love your shoes, love your blog! I die for those shoes- they are gorgeous and most definitely on my wishlist!